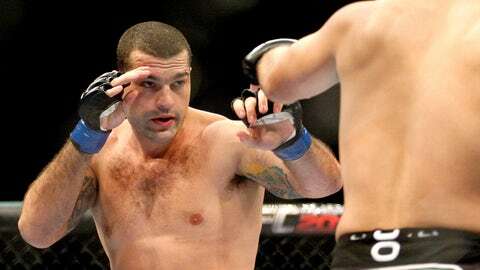 Could 'Shogun' Rua be facing the end of his career as a top-tier fighter? Mauricio ‘Shogun’ Rua has never been in the business of boring fights much less facing anything less than top ten competition throughout his career, but as he approaches his next bout at UFC Fight Night in Australia he‘s on the precipice of being forced to face some tough realities in his near future. Since Rua went on a historic run to win the PRIDE Fighting Championships middleweight Grand Prix in 2005 where he had to defeat Quinton ‘Rampage’ Jackson, Antonio Rogerio Nogueira, Alistair Overeem and Ricardo Arona to win the tournament, he’s been considered one of the best 205-pound fighters in the world. While he had to sit behind teammate Wanderlei Silva, who was PRIDE’s reigning champion at the time, Rua was considered the prince laying in wait to take the crown once the king fell. Rua never got that chance in PRIDE because the promotion folded, but after some up and downs in the early part of his UFC career due to several knee injuries, the grand payoff finally came for ‘Shogun’ when he knocked out UFC Hall of Famer Chuck Liddell and then two fights later became the UFC light heavyweight champion. Since that moment, however, Rua’s career has veered off course in dramatic fashion. Rua lost the title right after winning it as upstart prospect Jon Jones captured the belt in a dominant, one-sided performance to best the Brazilian legend. Following that fight, Rua has gone a paltry 2-3 with back-to-back losses in his most recent bouts. While no one will forget Rua’s gutsy performance against Dan Henderson where he may have pulled off the greatest fight of all time, he’s no longer in title contention and he’s dropped down to No. 9 in the latest UFC fighter rankings. As he approaches his next fight against James Te Huna this weekend, one has to start to wonder what’s left for Rua if he doesn’t come away victorious? In many ways, Rua’s past successes may very well haunt him to the point where his future is a dimly lit path with no prize at the other end of the hallway. If you think it’s hard to imagine Rua as the opening fight on a pay-per-view card, try contemplating him competing on the prelims against a newcomer to the UFC that’s never known what being in a title race feels like. It’s difficult to even imagine Rua sitting outside the top ten of the division, but that’s where he lands if he can’t pull off a victory against Te Huna on Friday night in Australia. At 32-years of age, Rua isn’t a young man in the sport of mixed martial arts and given the 11 years he’s been at this already, his body may be closer to 40 than 30 at this point. He’s been a part of some of the most epic wars that have ever happened inside a cage or ring, but what does the future hold for Shogun if it’s not title belts? Rua has teased the possibility of moving down to middleweight after this fight, and that might be his best option for longevity in the UFC. If he drops to 185 pounds off a win over Te Huna, Rua is immediately relevant again on the first day he’s in the division. He’s already knocked out Lyoto Machida (who is ranked in the top ten), and there are a slew of interesting fights for him against names like Vitor Belfort, Gegard Mousasi and Ronaldo ‘Jacare’ Souza. If he stays at light heavyweight, however, even with a win against Te Huna, Shogun risks the possibility of being Joe Montana wearing a Kansas City Chiefs uniform or Michael Jordan wearing the purple and black of the Washington Wizards. Everyone wants to remember Montana slinging touchdown passes to Jerry Rice in 49er’s colors or witnessing Jordan defy gravity while twirling around three defenders as a Chicago Bulls guard. It’s the same thing for Mauricio ‘Shogun’ Rua. He’s supposed to be in main events, fighting for titles or at the very least competing for a shot at the belt. Rua is meant to lead the charge into a soccer stadium in Brazil or have his name up in lights headlining a huge pay-per-view card. Thinking of Rua as anything less than a champion isn’t just off putting â it’s wrong. Nobody puts baby in the corner, much less Shogun in a meaningless bout at the bottom of a fight card. As Friday night approaches and the card starts to unfold, the pressure will mount on Shogun to convince the world that he’s still a major player capable of taking on the best fighters inside the Octagon. A win means he can venture to 185 pounds with his head held high and maybe even a sense of entitlement for what kind of fight he lands there on day one. Even if he chooses to stay at light heavyweight where a title shot will still be miles away from his reach, he potentially breathes fire into rematches with either Chael Sonnen or Dan Henderson, and a guaranteed spot in the main event or no worse than a co-main event slot. On the other side of the coin, a loss could bring the end to one of the most storied careers in MMA history because once you’ve sat on the throne it’s awfully hard to become just another subject in the kingdom.